today the newest wired arrived. as always, when scanning it for worthwhile stuff to read, my eyes get caught on the “fetish” page. nope, it’s not your normal fetish like latex and leather and stuff like that, but shining and gleaming gadgets and gizmos. 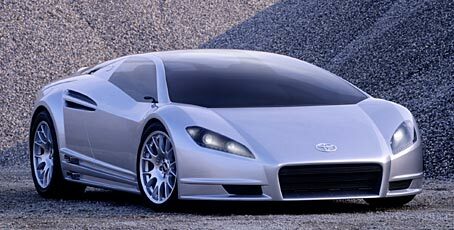 this time, the wired staff portrayed the toyota volta, a hybrid concept car. the volta is the bigger and much much spiffier brother of the toyota prius, which is a really big hit in the us. a hybrid car is – for all those that do not know – a car that has both a conventional engine and an electrical engine. both share the work, the electrical engine all the work where a conventional one is not good, e.g. accelerating and small burst of power, and the conventional engine comes to help when maximal power is needed, like on auto-routes. thus, such cars manage to be really fuel-efficient and environmentally safe (at least many of times safer than a normal car) while leaving the man or woman behind the steering wheel with the experience of a real car, so no charging of the battery or searching for that hydrogen filling stations. jetzt aber schnell ein paar worte und bilder zur velotour, ihr krassen 27.7-jungs.